🚨 Bulletin: Rudy Giuliani tells Chuck Todd on "Meet the Press" that President Trump "can remember having conversations" with Michael Cohen about Trump Tower Moscow right up until the election — as late as November of 2016. 1 big thing ... Trump's chyron obsession: "Rove is a dope"
For all his media bashing, President Trump sees the White House as the greatest show on earth and obsesses over the staging — micromanaging his own lighting, and constantly consuming the coverage of himself as if it were sports highlights. We learn in a forthcoming book by campaign confidant Cliff Sims ("Team of Vipers," out Jan. 29) that this fixation extends to the chyrons — the all-caps text at the bottom of screen. He consumed TV like the late Roger Ebert must have watched movies. ... He commented on the sets, the graphics, the wardrobe choices, the lighting, and just about every other visual component of a broadcast. Sure, he liked to hear pundits saying nice things about him or White House officials defending him from attacks, but everything came back to how does it look? With that in mind, the most Trumpian tactic the comms team employed was arguing with TV networks about the "chyrons," the words displayed at the bottom of the screen that act as headlines for whatever the commentators are discussing. When the President would deliver a speech somewhere outside of D.C., the research team would take screenshots of all the chyrons that aired while he was speaking. 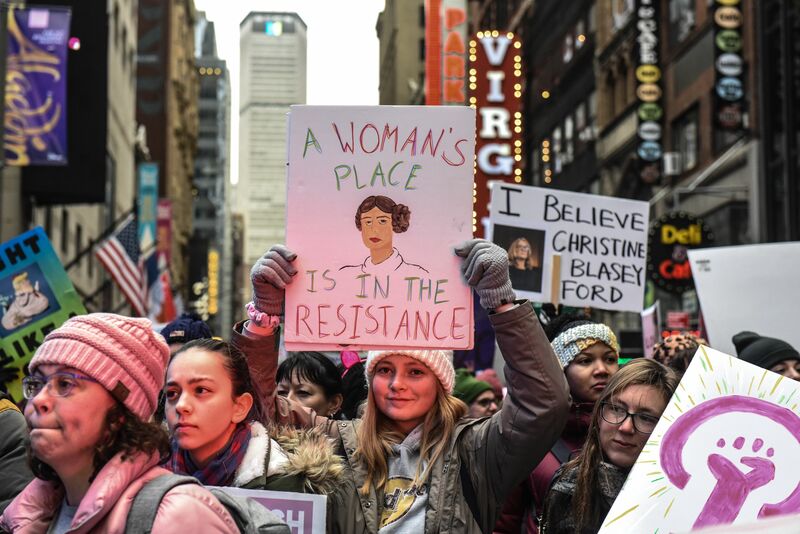 Then, adding those images to headlines and tweets from influential reporters and pundits, they would race to print out a packet before Trump made it back to the White House. The goal was for Sarah or Hope or me — or whoever hadn’t traveled with him — to meet him on the ground floor of the residence and hand him the packet to review mere moments after Marine One landed on the South Lawn. Since Axios revealed the first excerpt from Sims' book ("The Making of Trump's Enemies List"), there has been rising curiosity and anxiety inside the White House. "Team of Vipers" includes behind-the-scenes revelations — some comical, some troubling — about a range of Trump insiders, including some still in the West Wing. A publishing source said Sims and others involved in the book have been peppered with incoming queries from aides who want to know how they’re portrayed. “They know he has the goods,” the source said. "The graphics on Fox are the absolute worst — are you looking at this?" he said at one point. "CNN and MSNBC are both so much better. I hate to say it — honestly, I really hate to say it — but MSNBC has the best graphics. Fox is the best — they have the best talent. I mean, look at the rest of these people. They can’t believe what’s happening right now. But Fox’s graphics are terrible. They’ve got to do something about it." 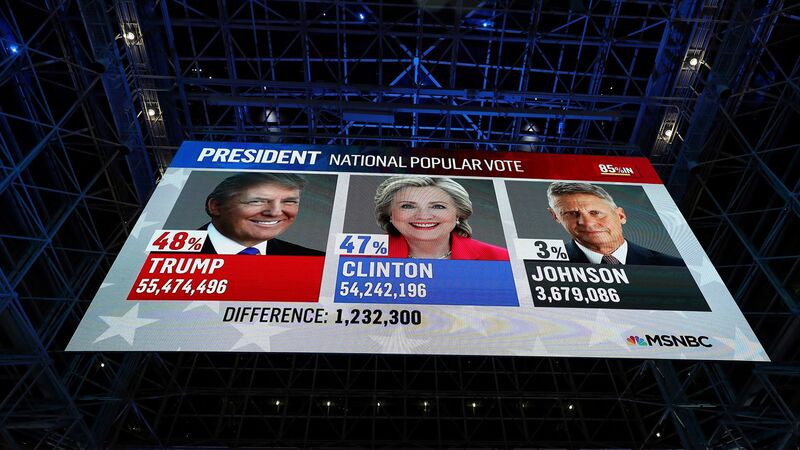 CNN’s John King was working the interactive map — or "Magic Wall" — ... turning states red and blue as results came in and playing out different electoral scenarios. "They’ve got John King on the maps again," Trump quipped. "I used to hate him on the maps, then the maps started turning red and I started liking him. But he wants the map to be blue. And everyone knows he should be an anchor by now. But [CNN president Jeff] Zucker has him on the maps, and we all know what that means." I actually wasn’t entirely sure what that meant, but no matter. I nodded knowingly just the same. At one point, with Fox News back on the main screen, frequent Trump critic Karl Rove came on to lambaste both Clinton and Trump. "Rove is a dope," Trump said, turning away from the screens for the first time. "How many times has he been wrong about everything but they still put him out there? This guy spent a half-billion dollars and didn’t win a single race [except the presidency — twice]. But they don’t say anything about that. He wants people to forget. I don’t forget, that I can tell you." 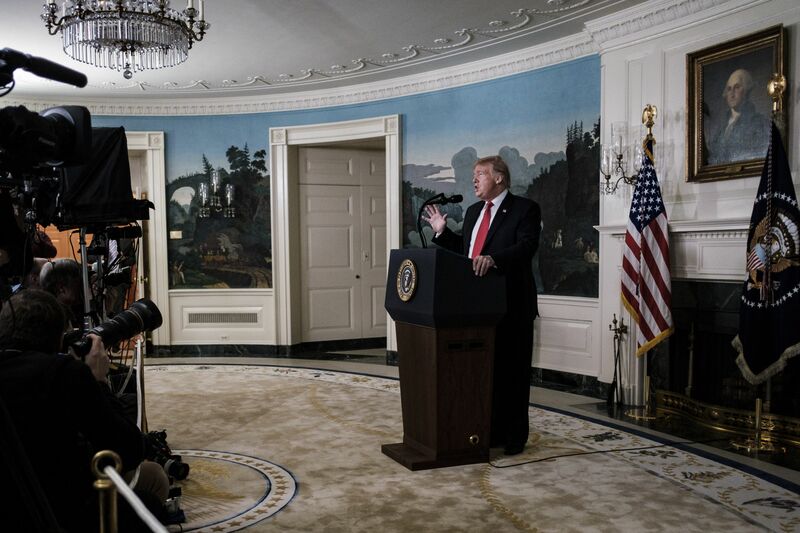 When Fox News commentator Tucker Carlson complimented Trump’s ability to articulate an antiwar vision to Republican voters, Trump said, admiringly, "He totally gets it." With his Dreamers deal being panned as a "non-starter" by Dems and "amnesty" by Ann Coulter, some Hill allies of President Trump are urging him to take his compromise message to the country. “He needs to go on offense and take the message outside the Beltway,” a Senate aide said. “He loves rallies. He could do three a day! All he has to do is show up and say: 'Make me an offer to reopen the government.'" Trump offered a three-year extension of protections for DACA recipients (roughly 700,000 people) and Temporary Protected Status (TPS) holders, in exchange for $5.7 billion for a border wall. Axios' Alayna Treene reports that Jared Kushner said at a meeting with reporters after the speech: "This could be a step toward broader immigration reform." Vice President Pence said: "There is no amnesty in the president's proposal. There is no pathway to citizenship in this proposal." Yamiche Alcindor‏ of PBS "NewsHour" tweeted: "VP Pence said that he and others have been talking to “rank and file” Democrats and got the idea to add TPS and DACA from those conversations." "Translation: The WH is looking for Dems to break ranks with Pelosi and Schumer and support Trump’s plan." "People familiar with the matter said [Mueller spokesman Peter] Carr told others in the government that he would have more vigorously discouraged the reporters from proceeding with the story had he known it would allege Cohen had told the special counsel Trump directed him to lie — or that the special counsel was said to have learned this through interviews with Trump Organization witnesses, as well as internal company emails and text messages." The N.Y. Times' Michael Grynbaum adds: "Several reporters who cover the Justice Department said they interpreted the [Mueller team's later] statement as a full denial of BuzzFeed’s conclusions." Be smart: BuzzFeed says its reporters had been dealing with Mueller's office for two years, and had never received guidance about a story in advance. It had not been BuzzFeed's experience that by being told more, the office would wave them off a story. 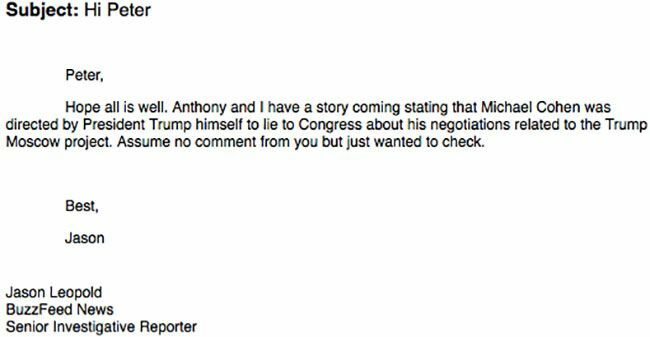 📺 BuzzFeed editor-in-chief Ben Smith, who still stands by the story, and Anthony Cormier, one of the two reporters, are scheduled to join Brian Stelter today on "Reliable Sources" (CNN, 11 a.m. ET). P.S. Last week's most-read article on NYTimes.com was: "F.B.I. Opened Inquiry Into Whether Trump Was Secretly Working on Behalf of Russia." 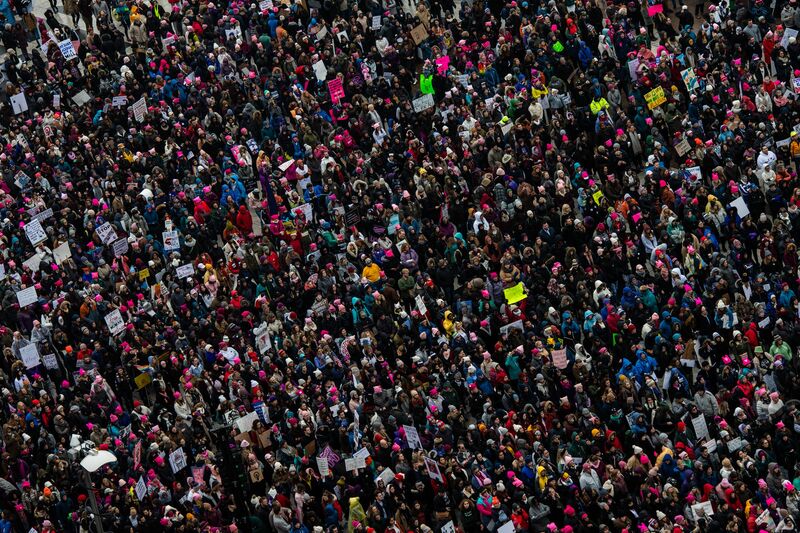 The Women's March in New York City (above) still drew large crowds yesterday despite a public dispute among organizers. In Washington (below), the signs along Pennsylvania Avenue included: "WE WANT TO SEE MUELLER'S FULL REPORT." And: "This is NOT Normal." "I came two years ago. It’s definitely smaller, but the spirit is very much alive. The experience I had two years ago was indescribable. I wanted to feel that way again." 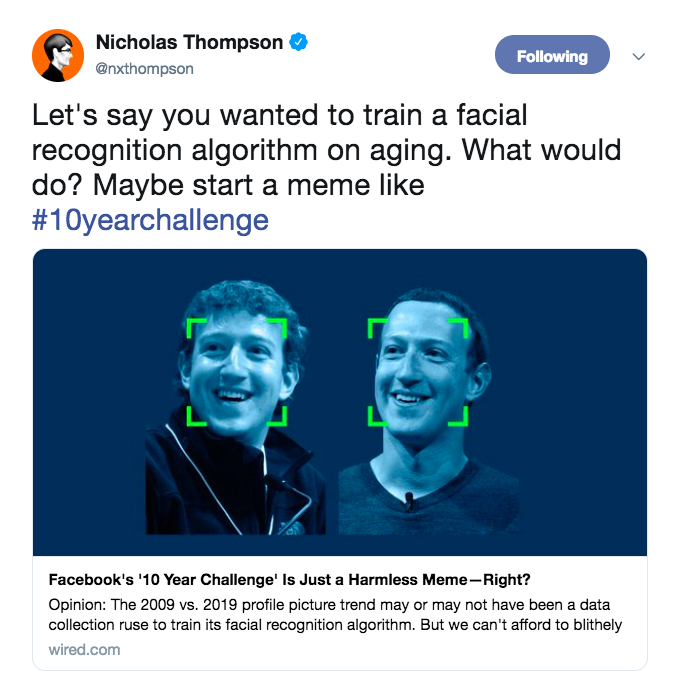 Now some are starting to worry: "Are we unknowingly helping giant corporations to improve their algorithms for biometric identification and age progression?" "Supporters of facial recognition technologies said they can be indispensable for catching criminals or finding missing people. But critics warned that they can enable mass surveillance or have unintended effects that we can’t yet fully fathom." "Lauren A. Rhue, an assistant professor of information systems and analytics at the Wake Forest School of Business, said the #10YearChallenge could conceivably provide a relatively clean data set for a company that wanted to work on age-progression technology." "But she added that Facebook already has billions of photographs on its platform, and people should be wary of any company being in possession of such a large trove of biometric data." Facebook responds: "The 10 year challenge is a user-generated meme that started on its own, without our involvement. It’s evidence of the fun people have on Facebook, and that’s it." "U.S. Magistrate Judge Bernardo Velasco's ruling Friday marked the first conviction against humanitarian aid volunteers in a decade." "The four ... were volunteers for No More Deaths, which said in a statement the group had been providing life-saving aid to migrants." Natalie Hoffman "was found guilty of operating a vehicle inside Cabeza Prieta National Wildlife Refuge, entering the federally protected area without a permit, and leaving water jugs and cans of beans there in August 2017." "The others were found guilty of entering without a permit and leaving behind personal property." 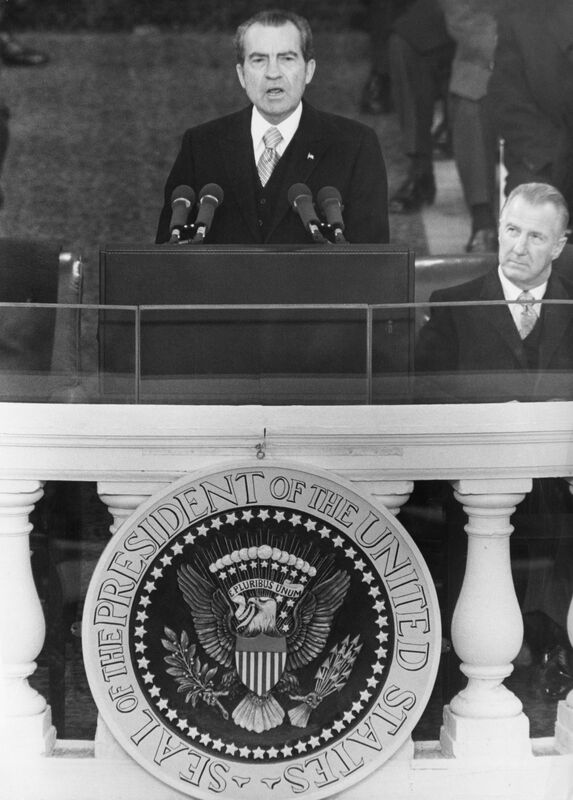 ... on Jan. 20, 1969, Richard Milhous Nixon, 56, was inaugurated the 37th president of the United States. He served just over 2,000 days — 5 years, 6½ months — before resigning. "His presidency would end in disgrace, but it began with him believing he had the vision and leadership to heal the nation." "[T]here was talk of peace from the old cold warrior, expressions of civil rights goodwill from the presidential candidate whose Southern strategy played on racial tensions, an air of reconciliation around a man who had sowed division."